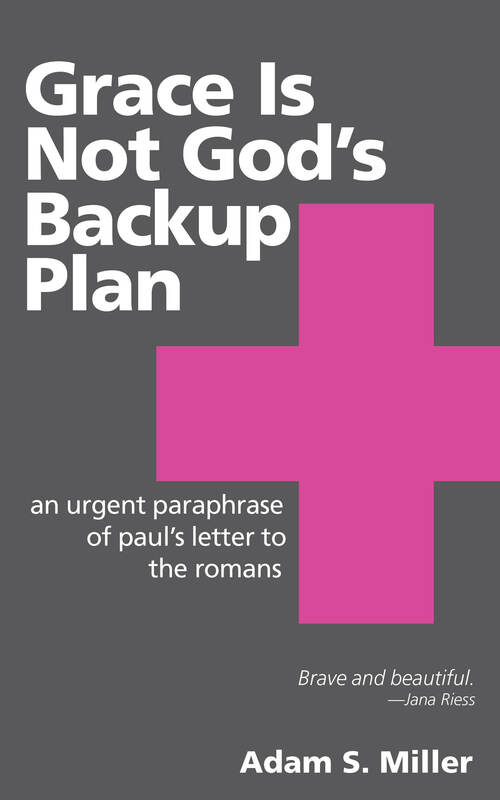 I’ve published a new little book, Grace Is Not God’s Backup Plan: An Urgent Paraphrase of Paul’s Letter to the Romans. It’s an experiment both in reading Paul and in self-publishing. My family and I were reading N. T. Wright’s “Kingdom Translation” of Romans and the kids were having a blast. Paul’s a great read in contemporary English. They loved, especially, Paul’s rhetorical questions (“Shall we sin because we are not under the law but under grace? Certainly not!”) and I loved, especially, the force of the letter when read out loud. I enjoyed it so much, I tried my own hand at it. As a philosopher, both my doctoral dissertation and my first book featured work on Paul. And I’ve been chewing on Romans, in particular, for a long time. Here’s a basic description of the book. Romans is a rare thing in religion: an explanation. Scripture is full of stories, visions, parables, proverbs, genealogies, poetry, prophecy, and even history. These are priceless. But beyond an occasional gloss, interpreted dream, or decoded parable, we’re never given anything like what Paul offers. We’re never given ten thousand words of raw explanation. With extraordinary insight and psychological precision, Paul lays bare the underlying logic of the gospel. He explains what sin is and why we choose it, the relationship between sin and grace, how sin abuses God’s law and subverts religion, how Jesus saves us from death and sin, and what a new life in Christ looks like, both individually and collectively. The view is staggering. But it’s hard to keep the big picture in focus. This has partly to do with the quirks and conventions of Paul’s writing—but only partly. A lot of it is us, not him. The King James Version, for instance, renders Paul’s letter with uncanny beauty but is opaque as an argument. Modern translations tend to have the same problem. Their overriding concern is with the letter of the text, not with its logic. As a result, Paul’s forest is always getting sacrificed for the sake of his trees. But Paul’s work is too important, his good news too urgent, to leave so much of him locked in the first century. We need our renderings to do more than mimic the original, we need them to bleed and breathe. What follows is not a translation in the ordinary sense of the word. It’s more like a paraphrase. Rather than worry over the letter of the text, my goal has been to illuminate the large scale patterns that structure it. With little hesitation, I’ve sacrificed some concern for details to a more urgent need for persuasion and clarity. At several points, I’ve cut some details for the sake of fluidity. At other points, I’ve expanded the material with additional explanation. Overall, I’ve purposely adopted a brisk, contemporary idiom. Rather than aiming for a respectable English version of Paul’s winding Greek syntax, I’ve aimed for a forceful presentation of Paul’s good news. In all this, I’ve worked more like a sound engineer than a translator. Take Paul’s letter as an old analog recording, full of background noise, suffering from distortion and disrepair. The older it gets and the more times it’s copied, the fainter Paul’s voice becomes. I’ve remastered the recording, cleaned up the sound, dropped the background noise, foregrounded the melody, added a beat, clarified the transitions, and looped some elements for emphasis and effect. What results is a kind of Pauline house mix. I have not, to be sure, produced the one true translation of Romans. I’m aware as anyone that some things have been lost along the way. But in itself, this is no objection. This is always true. And it would be just as true if I had, instead, chosen to be respectable. The question is never whether something was lost. The question is always what was lost. I’ve lost some fidelity to the letter of the text and, with respect to history, some verisimilitude. But I hope my live rendering of the Christian life Paul so boldly describes will cover some of the cost. Thanks for this introduction! Now I really want to read this. My copy came today. I like the way it looks as easy to read as a contemporary letter from a friend. But that’s all I’ve got after only a 5-second flip. Kindle. The only way to go on something like this. Let us know if you don’t get a cut. God forbid! I wish more people would do iBooks. I have lots of Kindle books, often because especially with academic books Amazon has more. But the Amazon app is vastly inferior to the Apple app. So I buy on iBooks as often as I can. It’s fairly easy to put together an ePub. If you’ve already prepared one for Amazon with mobi just use one of the dozen of online translation services or use the app Calibre. (A little tweaking your ePub after conversion is often necessary) You can also use Apple’s iBook author for authoring. The steps to put it on iBooks are fairly straightforward. I read Romans, Galatians, Ephesians, and Colossians and determined there was no way I could remain a Mormon. Thank you, Paul for opening my eyes. You can’t believe Paul and be a Mormon. If you do, you don’t understand Paul. There are only three possible ways to be justified. 1. Faith alone. 2. Faith + Works. 3. Works alone. Let’s examine #3. I cannot think of a single scenario in which this is even logically possible. If I work without belief, I don’t believe in the concept of justification in the first place. So I am not working to be justified. If I work because I believe, then my belief drives my works, and I cannot then say I am justified by my works alone. So without option 3 even on the table, when Paul says we are not justified by works, he can only be talking about scenario 2. So faith alone is the only way. Paul makes this so clear throughout. He also says that if you are justified by law, you are fallen from grace. If I am exalted through the Atonement by obedience to laws and ordinances, I am not exalted by faith alone. I think most Mormons agree. Exaltation is conditional. Elder Nelson says so. Faith + Works. So, if I am saved by grace (a degree of glory), but exalted by my works (eternal life), my attempt to bring myself back into the presence of God through my works makes me fall from grace, (justified by law, fallen from grace). Since grace is what I needed to even by saved in a degree of glory, and since I have fallen from it, there is no exaltation, no salvation. Only perdition is left in the Mormon cosmology. Absolute statements are always a red flag. The correct wording of your comment would be “You can’t believe Paul the way I believe him and be a Mormon. If you do, you don’t understand Paul the way I understand him”. I realize you see justification in the way many Mormons speak. But a reading of King Benjamin will show that any Mormon who thinks to justify themselves by their deeds just have it wrong. I will grant many have it wrong. But the doctrine is not wrong. You threw the baby out with bath water. We can’t even earn a higher place by our deeds when we do the math King Benjamin style. The moment we do anything good we receive grace and therefore we are paid and remain indebted–indeed when we die we will not have paid a single mite of the debt owed. Whether we did well or no, none of us will have made any deposits in the bank of salvation. The account will be zero. The doctrine is clear. What then of works? We proclaim our faith by our works. It is easy to say with the mouth, “I accept Christ.” It is harder to proclaim “I accept Christ” in truth. This can only be done with deeds, works. Do say “I accept Christ” and then not go and do is to lie, plain and simple. We earn nothing by our works but we still must proclaim our belief every day or fall from grace. Now, of degrees. God loves us, and loves more those who love him, who demonstrate by their faith, how much they love him. And as a GIFT, he will save all, but he will love some more and for them he has even greater GIFTS. It will not be earned, but he will GIFT more. Quoting the Book of Mormon to make a point as a Mormon is always problematic because so much changed in Mormonism after its publication. The Book of Mormon does not accurately represent Mormon doctrine today. It is a humble foundation about the size of a small 2-bedroom house. Smith and Young and all the rest have built a house the size of Gatsby’s on top of it. The Church steps in between your relationship with God and dictates to you what those works need to be that should follow your faith. The person who knows God does not need any man to tell him this. The Holy Spirit tells him this. This is the new covenant. No one likes to be treated that way, so to make the medicine go down, they are sure to talk about all the marvelous blessings you can expect! Thrones, powers, dominions. etc. etc. Back in Brigham’s day, that list include numerous wives and children. That perk isn’t quite the motivator anymore. It draws a lot of unwanted attention, so it seems to have been scrapped. Today the focus is on family. Eternal family is the reward for the highest achievers. So, now, your family is held hostage. What is the ransom? Total compliance. I bought the book on Kindle because I have been on a binge of discussing Christianity from a more “back-to-basics” perspective, and I thought, “Wow, wouldn’t someone who can break down Paul really be a good fit”? I haven’t gotten all the way through, but from the first 6 or 7 chapters, the way Paul’s letter seems totally unreal still seems unreal. Like, I don’t know (or particularly care) what it means to be born in the law, dead to the law, born to sin, dead to sin. It just doesn’t seem all that applicable to my life *as it is presented here*, so I feel no urgency for grace. I accept your Mormon credentials. Still, can you not see that you changed the discussion from the baby to the bath water? I don’t to talk about the bath water. It is always grimy–that’s the residue of getting ourselves clean. I believe our doctrine remains one of grace and many of us are working from within to help our family and friends see the gospel and doctrine in that light. I too am a long-lived Mormon, relatively longer in my case than yours. I study every other week with my Christian neighbors in my immediate neighbor’s garage. We had a nice discussion on this just the other day. I agree, discussion from the POV of legalism leads to self-justification. Discussion from the POV of Grace leads to gratitude. Any attempt by a Mormon to self-justify by the performance of good deeds has missed the boat and will at some point suffer with not understanding why they can’t more fully feel HIs love in their lives–until they return to Christ as the only justifying influence. But it not only can be done in Mormonism it can be done in spades. He has so much love to give to those who love and serve Him. I have not read the book in question. Don’t need to. I feel the authors understanding because I have felt it from that point of view and recognize it when I see it. I hope we will feel to applaud any effort within the church or out which leads to greater understanding of God’s grace. I suspect your beliefs about grace are the same as mine. But mine led me out of the church. You seem fine in it. I guess that’s okay. Methinks someone perhaps didn’t know Mormon doctrine. Grace is in it through and through. It’s not always called grace. But then it’s not always called that in the Bible either. I still think Paul presents things in a tad convoluted way. Romans being one of the key texts. But it’s Mormon through and through. Thank you John. God bless. Adam, I’m wondering how you would compare your translation with Eugene Peterson’s, found in The Message, who seems to share your goal. As to Romans relating to Mormon concepts of grace, I have no problem saying that Luther and much of the Protestant tradition that have followed him, get Roman’s wrong. They seem curiously uninterested in who Paul was, who he was writing to and why. Instead just reading it like Mormons read the Book of Mormon, as if context was unavailable to us. purpose of defending the rights of Gentile converts to be full and genuine heirs to the promises of God to Israel . . . . In none of [Paul’s] writings does he give us information about what he thought to be proper in these matters for Jewish Christians. . . .
“We tend to read [Paul] as if his question was: On what grounds, on what terms, are we to be saved? . . . But Paul was chiefly concerned about the relation between Jews and Gentiles—and in the development of this concern he used as one of his arguments the idea of justification by faith. . . . If we read Paul’s answer to the question of how Gentiles become heirs to God’s promises to Israel as if he were responding to Luther’s pangs of conscience, it becomes obvious that we are taking the Pauline answer out of its original context” (Paul among Jews and Gentiles [Philadelphia: Fortress Press, 1976], 2-3). Christian, I think for Mormons N.T. Wright and the whole New Paul movement is a breath of fresh air. I think the old more Luther styled reading of Paul inexorably leads to bad ideas like cheap grace. Cheap grace is of course a heresy in mainstream Christianity including Evangelicalism. However it’s surprising how many of the laity take “salvation by faith” to entail a theology of cheap grace. i.e. it doesn’t matter what I do, so long as I believe in Christ everything’s fine. I hope it is clear from all this that Paul is thinking with entire consistency. Of course, if we come to him with a less than adequate frame of reference, such a low-grade protestant understanding which has downgraded free grace into cheap grace, it is easy to get muddled and then, projecting our problems onto Paul, to accuse him of the muddle, as though he had simply decided to hold onto some bits of an ethical code and go soft on other bits. No: when we get to know Paul better we see what is going on. In particular, we may remind ourselves of the towering significance, in his thought, of Romans 6.1-11. Having just expounded the gospel of grace, God’s rich, welcoming and forgiving love meeting us where we are, helpless sinners (5.6-10), he faces the question: if God’s grace meets while we are sinners, must we therefore stay as sinners so that God’s grace can go on meeting us there? He knows the answer as soon as he has asked the question, but a great many people in today’s church do not know it and cheerfully answer, ‘Yes!’ instead. It is one of the most important principles of biblical ethics, and one trampled in the mud again and again in contemporary debate: that God’s grace meets us where we are, but God’s grace, thank God, does not leave us where we are; that God accepts us as we are, but that God’s grace, thank God, is always a transforming acceptance, so that in God’s very act of loving us and wooing our answering love we are being changed; and, more dramatically, in baptism and all that it means we are actually dying and rising, leaving one whole way of life and entering upon a wholly different one. Clark, yes, I can give Wright much of the credit my current understanding of Paul. Gee, you are right. I simply didn’t know Mormon doctrine, but those who can say Paul is convoluted are definitely those who know Mormon doctrine the best. In reality, it is convolution that requires two definitions of the word salvation. And that is what Mormon doctrine needs. The reason Mormons have two definitions for it is that the doctrine of exaltation is not found in the Bible, nor in the Book of Mormon. And therefore, to continue to embrace both books, the word salvation needs to do double duty. It has to mean both salvation in any of the degrees of glory, and salvation as an eternally progressing being in the presence of God the Father. When I talk to Mormons about salvation, they will tell me it is indeed a free gift. When I press them on this, they will then change their story, and say, “Oh…well you are talking about exaltation!” Which, of course, it what they were meaning when they were saying salvation all along. But when I showed them how salvation isn’t free, they change the parameters. Because, like I said, in Mormonism, salvation does double duty. It means salvation when talking to Christians. It means exaltation when talking to Mormons. And thus the deception continues. But it is NOT the salvation as described in the Bible or Book of Mormon. No 3 degrees. No godhood. No eternal family. John, as I said Wright and the New Paul scholarship pretty well give LDS doctrine over the more Lutheran take on Paul. Mormons don’t have two senses for salvation. At best they distinguish from being saved from death which is a free gift of Christ to all and being saved from sin which one must take hold of. But again that’s mainstream Christian theology. It’s hardly unique to Mormons. The issue of degree seems separate. I get that some might want it all or nothing, but as Wright notes, that’s at odds with Paul himself in places like Romans 2:6-9 among many places. We’re judged according to our works which implies degrees. Salvation is a free gift in that it gives us the ability to follow in the spirit. Every Mormon believes we’re given the spirit and that the spirit is an enabling power both in terms of teaching us but also in terms of giving us power to accomplish the things he’s given us. It’s true that until recently Mormons tended not to use the terminology of grace for this but it’s certainly the theology of grace. If one fully takes hold of grace and lives the life of holiness then that entails exaltation. The problem of course is that not everyone takes hold of the free gift of grace that is offered them by Christ. There are plenty of others. Take Mosiah 15 where Abinadi is speaking of how Jesus is both the father and the son. He is father because he’s subjected the will of the flesh to the Father and is conceived by the power of God and become One. Then we’re told about how others will be his seed, the way he is the son of the father. This is pretty clear on deification, especially if one is familiar with Merkabah literature from Jewish sources from about 2 BC – 500 AD. As for families the whole point of salvation in the Book of Mormon is to enable a restoration (See especially Alma 40-41) So of course there will be families because what’s restored is what we had in this life. That entails family. Perhaps it’s made more explicit in places like the D&C but it’s definitely entailed by the Book of Mormon. Alma is quite explicit that restoration is to restore good for good. If families are good then they are to be restored. In any case I’d say now you’re speaking of what are the consequences of salvation rather than salvation proper. The question ultimately is whether Paul presents anything that contradicts this. You’ve not done that at all. Scripture does not use terms consistently. Written by different authors in different cultures hundred of years apart (or more), there is no reason why they should, especially once we bring in translation to a foreign language. Second, (although I disagree with you on this), there’s no warrant for the assumption that we should expect to find all LDS doctrine in either the Bible or the Book of Mormon. Third, although most Protestants are ignorant of deification, it was an early Christian doctrine rooted in the new Testament, and there is a good bit of recent non-LDS scholarship on this. LDS have naturally been interested in this and republished some of it, e.g. this MA by a Catholic. On several of these points, you seem to want some kind of global consistency, which is not a realistic assumption for anyone. Theological diversity is a challenge to many people (especially Evangelicals), and Mormons don’t particularly care for it either, but it’s a reality of scripture and existence. Is the Book of Mormon right when it says that only those who call on the name of Christ will be saved. Or is D&C 76 correct when it says that those who do not receive the testimony of Christ will be saved? “In the doctrine of The Church of Jesus Christ of Latter-day Saints, the terms saved and salvation have various meanings. According to these meanings, your answer to the question “Have you been saved?” will be either “Yes” or “Yes, but with conditions.” The following explanations outline six different meanings of the word salvation.” -True to the Faith. It goes on to list these six different meanings. Salvation from Death. Salvation from Sin. Being Born Again. Salvation from Second Death. Salvation from Ignorance. Eternal Life/Exaltation. Terms != ideas of salvation. I was careful to distinguish that and already noted that. Certainly I don’t disagree with those common uses of the term. I could even add more such as political salvation for Israel (say from Assyria in 2 Chr 32:11) However that’s not what we were discussing. So you’ve changed topics from the meaning of salvation in terms of atonement to the meaning of the term in rhetoric. Deification is still a major doctrine in the eastern forms of Christianity. To be fair, I think Mormons have to be careful when they bring it up since the notion in eastern Christianity is quite isolated from the types of material conceptions Mormons have. However the basic ideas are more or less the same. That is Eastern Christianity tends to separate deification from the mystic union that tends to pop up as a heresy in Christianity due to the influence of neoPlatonism. One place Mormonism does differ from eastern Christianity is that we are willing to make more of an ontological equation between man and God that eastern Christians would definitely find blasphemous. However this is largely due to our rejecting creation ex nihilo rather than embracing the type of union of neoPlatonism. Theological diversity and progressive revelation, John. Just one reason why scripture is not completely internally coherent, the Bible included. “Theological diversity and progressive revelation” starts to look a lot like the history of Christianity in general, you know..the Church of the Devil, and not what I was taught the Lord’s One True Church would look like. But it’s my fault for not getting the doctrine right. Never mind that you can hear all varieties of competing doctrine from sacrament meetings to stake conferences to general conferences to seminary to zone conferences. This is that “theological diversity” that you are now implying is a great thing. Ask the Correlation Committee if they think it is a great thing. I just didn’t understand the doctrine, and that is why I threw the baby out with the bathwater. Right… There was no baby in the bath water. Not everything is revealed. People interpret incomplete data. Revelation corrects opinion. People use different rhetoric to talk about the same thing. None of this is controversial in the least Saying that this wasn’t what the Church taught seems quite odd. Leaving over it even odder – especially if you went and joined mainline Christianity since it accepts all the above in spades as well. I think you do a sincere work, Adam. I appreciate your willingness to share your testimony. My problem with anyone’s interpretation of Paul, though, is that, without exception, it seems everyone leaves something out. The only person who agreed with Paul completely was Paul. (just ask Peter or Barnabas, not to mention James) Evangelicals leave out the predestination. Latter-day Saints leave out the faith of grace over works of the law. Everyone except Latter-day Saints leaves out baptism for the dead. And almost anyone modern leaves out at least some degree of the rampant sexism. So, to me, “remastering” almost certainly just means removing all the things you disagree with while making it more straightforward and readable. That’s why I love the literal translations of Paul, as convoluted and opaque as they can be at first glance. At least they’re closer to the genuine article. In other words, I like the grain: that keeps it authentic. When I disagree with Paul, I want to make sure it’s Paul I’m disagreeing with, not just some translator. Or when I gain some great insight, which also happens, I want to credit that to the original source. If I’m wrong, please show me the church that doesn’t allow women to speak in it, and forces them to ask their husbands questions at home. Even the most patriarchal I have seen have softened that to simply prohibiting women from teaching, or for Latter-day Saints, ruling, in the church. There may be an exception out there somewhere, but I haven’t seen it, and I wouldn’t be impressed if I did. I think a lot of what Paul taught is rightfully left in the past, to first-century Saints in Rome or Corinth, as most of his letters undoubtedly are. But I think that is best left to each person to decide for herself or himself. Adam, I look forward to reading your book. Thanks for the intro. Clark, we buy most of our books in digital form (our library is full and overflowing) and read them on iPads. There is a Kindle reader app that works well for us. John, for what it’s worth, Sam and I put in our bid to solve the faith/works/grace-of-the-gaps conundrum using math. :) You might find it interesting: The Salvation Equation. Alison, the Kindle app works, but I just don’t like it as much as iBooks. Yes, I know, first world problems. There are other reasons to perhaps be more distrustful of Amazon as well. I don’t want to go too far down a tangent and distract from Adam’s post. I gave some extended thoughts on ebook readers and pluralism here.